Moonraker stands as the only Bond film for which I feel a nostalgic affection. That's due to the fact it was the first Bond picture I ever saw. At least I think that was the case; I'm not a hundred percent positive, but my memories tell me I had very little awareness of 007 prior to entering the cinema during the summer of 1979. My Dad dragged me and my friend to see it somewhat against our wishes - bizarrely, we wanted to see Barbra Streisand’s The Main Event instead! - and for once, the Old Man was correct. Both my friend and I had a terrific time, and I at least was set on the path to being a Bond fan forever. Well, a moderate Bond fan, at least. I've never been hugely fond of the series, though I've always really liked a particular few. The release of the movies on DVD led me to rediscover the whole batch of films, and through that experience, I reshaped my sentiments about many of the pictures. Despite the fact I loved it when I was 12, my impression of Moonraker actually remained negative for many years. I can't recall the last time I saw it, though I think I checked it out in the early Nineties and thought little of it. However, I do now recognize that my general disdain for the Roger Moore years has tainted my opinion of all his films and that some are actually pretty good. As such, I entertained the notion that I might have been on the right track as a youngster and I could possibly enjoy Moonraker at the ripe old age of 42. That concept vanished pretty rapidly soon after the disc started to spin. I wanted to like Moonraker - honestly, I want to like all of the Bonds - but I just couldn't get there. The film is possibly the silliest and least coherent of all the Bonds. Each of the films is unrealistic, but Moonraker goes so far over the top in that regard that it becomes absolutely ludicrous. Moonraker also echoes the very successful immediate predecessor through its main female lead, Dr. Holly Goodhead (Lois Chiles). Spy’s Major Amasova provided a strong and competent woman. Although Barbara Bach was rather poor in the role, at least the part itself made for a nice challenge to the usual pathetically weak Bond babe. 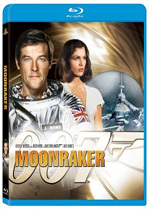 Moonraker appears in an aspect ratio of approximately 2.35:1 on this Blu-ray Disc. Across the board, the movie looked great. Sharpness seemed superb. The movie presented solid clarity and definition, with only a smidgen of softness along for the ride. I noticed no signs of jagged edges or shimmering, and source flaws failed to materialize. This was a consistently fresh transfer. Colors seemed solid. The best scenes came from the vivid hues of Rio, but all segments displayed nicely clear, distinctive tones. Black levels were dark and taut, while shadows usually seemed perfectly acceptable. A few “day for night” shots looked a bit murky, but most of the flick showed good delineation. Overall, I felt the picture quality was very satisfying. For this DTS-HD MA 5.1 remix, the forward soundfield offered most of the action, with plenty of nicely localized audio from all three front channels that blended together well. The rears also provided quite a lot of information. They bolstered the forward mix in a satisfying manner and added a reasonable amount of information to the action sequences. 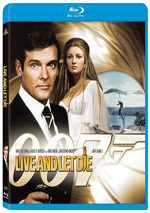 How did the picture and audio of this Blu-ray compare to those of the 2006 Ultimate Edition DVD? Audio was pretty similar, but the visuals showed an upgrade, especially in terms of sharpness. I thought the DVD could look a bit soft, but no such concerns marred the Blu-ray. It often provided spectacular picture quality. The Blu-ray offers all the same extras as the Ultimate Edition. We start with two separate audio commentaries. The first comes from director Lewis Gilbert, screenwriter Christopher Wood, associate producer William Cartlidge, and executive producer Michael Wilson. They all sit together for a running, screen-specific chat in which they offer a refreshingly frank and fun view of the movie. For the second track, we hear from actor Roger Moore. He presents his own running, screen-specific discussion. He touches on a few production details, thoughts about various members of the cast and crew, and a variety of stories somehow connected to the film. The Mission Dossier splits in seven areas. 007 In Rio provides an “original 1979 production featurette” that lasts 12 minutes, 44 seconds. It features movie clips and footage from the shoot along with comments from Gilbert, producer Cubby Broccoli, and actor Lois Chiles. Despite a few decent shots from the production, this is mostly a tedious promotional program with little to offer. Another archival component, Bond ‘79 runs 12 minutes, 17 seconds as it features soundbites from the same sessions that appear in “Rio”. We hear from Broccoli, Gilbert, Chiles and Moore. They chat about “Bond in space”, changing the series for the modern times, and other aspects of the Bond experience. While the information isn’t particularly deep, it offers a reasonably interesting perspective on Bond at the time of Moonraker. Information from the production designer appears via Ken Adam’s Production Films. Adam narrates this 12-minute and two-second compilation of shots. We see location scouts and aspects of the shoot. As always, these offer a fun glimpse of the production, and Adam adds nice insights. Skydiving test footage comes under the banner Learning to Freefall. The segment fills three minutes, 55 seconds. Mochael Wilson introduces the clips of aerial rehearsals. It’s a decent piece that offers a good take of the challenges. We also find some SkyDiving Storyboards. This 81-second reel shows planning materials for the aerial segment. A few minor snippets finish this area. Circus Footage runs 78 seconds, while two Cable Car Alternative Storyboards go for 83 seconds and two minutes, 10 seconds, respectively. The “Circus” material shows cut shots from the opening sequence, while the “Alternative Storyboards” offer a view of unused concepts. All are pretty interesting. Wilson provides narration to inform us about the elements. With that we head to the 007 Mission Control Interactive Guide. 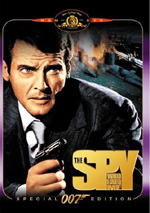 This splits into components under seven different headings: “007”, “Women”, “Allies”, “Villains”, “Mission Combat Manual”, “Q Branch”, and “Exotic Locations”. An odd form of “greatest hits”, this simply presents a few selected scenes that match the topics. 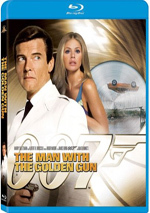 Surprisingly, this disc cuts back on the plethora of promotional materials we typically find on the Bond releases. The others toss in multiple trailers plus TV ads and radio spots. However, on Moonraker we only discover one theatrical trailer. Why so little? I have no idea. Perhaps they've gotten lost, but it seems odd that a relatively recent Bond would lack these components whereas much older efforts still boast lots of materials. Unfortunately, that and the other strong supplements aren't enough to redeem Moonraker, for it remains a fairly lame movie. I like the Bond pictures and find enough fun in Moonraker to get me through it, but it's possibly the worst Bond to date. The Blu-ray provides very good picture and sound plus some fine supplements. Despite the poor quality of the film itself, the disc is good enough to warrant purchase from serious Bond fans; all others should probably skip it, however. Should folks who already own the UE DVD pursue this Blu-ray? Yup – at least if they really like the movie. The Blu-ray offered often stunning visuals that improved on an already attractive DVD.